Author Note: Laura Hartman was most recently at DePaul University. She also currently serves as executive director of a trailblazing trilingual elementary school in Haiti, the School of Choice/l’Ecole de Choix. She is also cofounded an online micro-development, finance, and education system for people living in poverty in Haiti, called Zafen. Previously, Hartman served as director of external partnerships for Zynga.org, the charitable arm of the social game developer Zynga. She has written many other books including Rising above Sweatshops: Innovative Management Approaches to Global Labor Challenges. 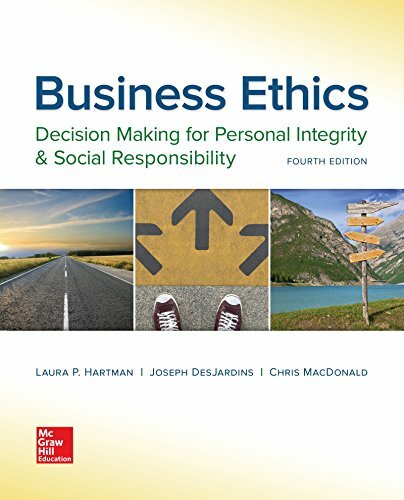 Business Ethics: Decision Making for Personal Integrity & Social Responsibility 4e provides a comprehensive, accessible, and practical introduction to the ethical issues arising in business. Hartman et al., focuses on real-world ethical decision making at both the personal and policy levels and provides students with a decision-making process that can be used in any situation. Practical applications throughout the text show how theories relate to the real world. The 4th edition features thoroughly updated statistics and coverage of timely issues and dilemmas throughout the text.